Huskisson Bed and Breakfast, Jervis Bay offers Boutique B&B accommodation – vintage beach style – on the NSW South Coast, Australia. See our Specials Page for winter deals. Huskisson Bed and Breakfast (Jervis Bay accommodation) is great for a weekend escape, romantic birthday or anniversary, refreshing break or the highlight of your holiday in Australia. We are just 2.5 hours from Sydney and Canberra. Huskisson B&B is close to Jervis Bay’s main hub of Huskisson,the famous white sand beaches of Jervis Bay (Huskisson Beach, Vincentia & Hyams Beach & Booderee). 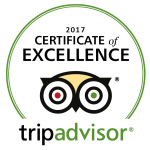 We have been awarded the TripAdvisor certificate of excellence for 9 years in a row with 5 stars every year. We are in their Hall of Fame. Huskisson B&B is 3-8 minute walk from Huskisson village cafes, restaurants, Huskisson Cinema, The Husky Pub, dolphin and whale watch cruises, wharf, sea-pool and beaches. This historic 1913 Jervis Bay guesthouse has been renovated in a light and airy, rustic beach style with all vintage touches and modern luxuries. Super-comfy queen beds, TV and DVD, free fast WIFI. Ensuite bathrooms have clawfoot baths and showers. Organic shampoo, conditioner and soap with bubble bath included. Heated floors in winter. 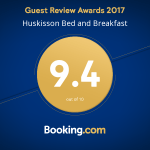 Guests often return to Huskisson Bed and Breakfast because of its relaxed, creative, character, genuine hospitality and attention to detail. We are a proud environmentally friendly ‘Green B&B’ as we recycle, use natural cleaning products, have solar hot water and we line-dry all our linen. The guest sitting-room has a real wood-fire in winter. All rooms open onto the verandah. Free continental (light) breakfasts are mostly homemade with fresh (some homegrown) produce including toast, cereals, fruit salad or compotes, real coffee and tea. We are sad to announce that we no longer take children (including infants) or pets. Jervis Bay is known for its white-sand beaches, clear blue water, laid-back seaside villages, boutique shopping and coastal National Parks. Huskisson is the hub of Jervis Bay and makes an ideal base for exploring the whole NSW South Coast, the Shoalhaven (Berry, Kangaroo Valley, Milton & Ulladulla), the Grand Pacific Drive or as a perfect stopover on the Sydney to Melbourne coastal drive. Check availability and rates on our online calendar, then book and pay your 50% deposit with our secure online booking system (Little Hotelier). Or if you can’t manage online, you can email us with your dates and details. Phone or text with your enquiry on 0407 929 083 (between 9am & 6pm please).